605 and 4116 (both short hood forward) derailed just short of MP 1 eastbound at Greenwich on Tuesday March 8th while pulling the flanger. Leading truck of the 605 skewed badly towards the (north) hillside due to the accumulated ice. After many attempts to jack/block/crib during the next two days finally the decision was made to bring in RJ Corman. They arrived on Sunday morning and two hours later both locos and the flanger were tucked away successfully at the engine house back in Greenwich. Earlier on late Friday afternoon "borrowed" Pan Am 352 powered five hot cars north from Eagle Bridge to the mill and returned that same evening to EB several hours later. These are some shots of our operating session the other night (2/27). We started around 3:30 and went til around 11:30 with an hour lunch. Except for sore feet, we really don't realize how long we've been going. In the pictures are Lianne and JR Stevens, Tim Stockwell, Bill Bibby and my wife Katherine (keeping Bill entertained). A shot of my train sheet from the days running. We had 17 trains show on the main which includes the trains off the SAR and locals that only OS at one or two Cabins. If we ever run more mainline trains, I'll have to do something about all those locals or I'll run out of room fast. Lianne is the conductor on SC-2 spotting a hopper at Norlite with the 453 and 2311. In the Crew Room is JR at the throttle of SC-2 while Bill and Katherine chat by the fire. In Mechanicville, # 37 has just arrived at the station with Lianne at the throttle while Tim is getting ready for a return trip up the SAR with SM16. Bill is at his post on the B&M side where he can see all that's happening in the yard. I gave Bill a throttle and now he has to figure out what to do with it. Tim working SM16 on the SAR at Towle and Son Sand and Gravel using borrowed D&H 7319 and the SAR 77. I was out overnight celebrating the arrival of March 1st! This is the month where signs of spring start to appear around us in Vermont. MM&A train 710 with assigned B39-8 8569 seemed like an obvious night photo candidate, and I waited in Richford until I heard them departing from above the border in Farnham, Quebec before heading over to this spot in Newport to set up. Railfan rule number six: "Always make certain your train leaves its terminal before you do." Rolling into the city, the bank air temp display reads twenty two above, not bad for March 1st. Then I drove down to access the overlook I had in mind to shoot from, and problems begin to appear already concerning "signs of spring", LOL! The view from the overlook is spectacular! But......it features a full northern exposure along Lake Memphremagog which stretches many miles north across the border........and the wind is howling out of the north! Snow squalls come and go in bursts.......snowflakes flying by me horizontally. Its because of nights like this that my fleece pants resurface atop the debris field the back seat has become in June! Ha,ha,ha! They stay in the car for occassions such as this. Oh but the view here! Once I have added the extra layers of clothes and start setting up the lights along the tracks everything falls into place. A big part of the fun of night photography for me is just getting the lighting "set up" for me. And with this being my first visit here once I finsh setting up out comes the camera and tripod and the fine tuning begins. When I drove in here tonight I thought it odd that the sidewalk to the overlook was'nt opened up, plowed or something. The observation revealed a hint of what was to come! Ha,ha,ha! Oh but the view of a train passing by. So trying a test shot I see a couple adjustments to the lighting I want to make, I figure I have time and jump back into the civic to drive down below. While I finish moving a couple lights around, I hear a single blast of an air horn from up the lake! Not realizing the sound is being "carried well" by the north wind I drive back up to the camera to wait.........and wait. The camera strap is flapping horizontally, the snow has stopped, the wind has not. Ahhh, this is why I bought my new tripod which will support eighty pounds! Ha,ha,ha! I look down at the light stands, anchored with sand bags, the flash units atop them weaving in the wind. I remind myself, its amazing this system works at all in weather like this! Thank god its March or it would be really cold out! Ha,ha,ha! Two small city plow trucks go down over the crossing plowing, and they courteously avoid taking down the light stands along the street. Then the air horn again closer this time. From my perch I can look squinting across the end of the lake here and spot Newport Marina, and the outline of the open fill I shot 8569 on this past summer. With train speed of perhaps ten or twenty mph in places, there should be no surprise appearances here. A bucketloader starts moving snow around beyond the tracks, leaving me contemplating what next? This driver also avoids taking down the lights stands around the building, nice! But........I don't really want a bucketloader in my night photo eh? Then I notice it! The tracks in the distance across the lake and above Newport Marina are lit up. They made it down the hill! And silently 8569 appears then disappears behind the marina, emerging to cross the fill coming towards me. I fire off an awareness flash for the crew, not realizing they will have time at ten mph to count each light stand as they pass through the lighting setup! But only the building is lit up in the test shot! The flashes lighting up the train don't go off. A second try, same results. I think, well........at least we are not 2000 miles out tonight! Ha,ha,ha! Its no small wonder why, looking down at nearby flash units, the Pocket Wizard controllers bouncing around in the wind. Then out from behind the bluff comes 8569, snow all over the place, into position she arrives, I mentally remind myself that this would be a great time for the lighting to work! LOL! And press the shutter.............and the lighting does its thing! With a big smile I give the crew a wave as they pass by underneathe me, the engineer giving me a couple toots in return. 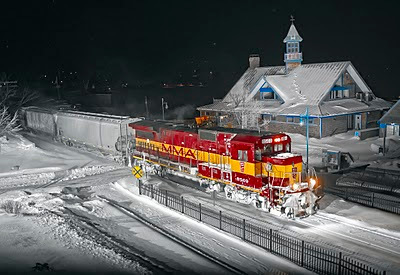 I watch the short train pass by, thinking what a wonderful spot to catch 8569 at...........then head for the warmth of the civic to begin rescuing the light stands. Shot in Newport, VT on March 1, 2011 at 04:10 with the 5D and Zeiss ZF 35/2 lens. Please enjoy! Comments are welcome.